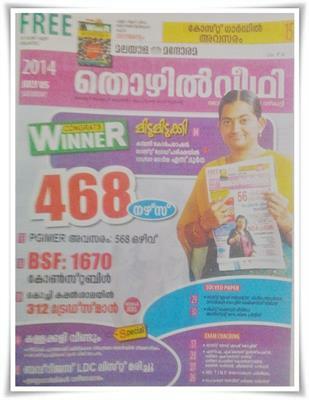 Manorama Thozhilveedhi, one of the leading employment news weekly in Kerala has published the 5th July 2014 issue. The current issue as usual is packed with handful of job opportunities. The major highlight of this issue is the arising vacancies for nurses, opening in PGIMER, constables in BSF and Tradesman in Kochi Shipyard. Added to it vacancies in Catholic Syrian Bank, prospects in various Universities, Colleges and Schools are also reported. An exclusive interview featuring S Durga who scored full marks for the Kerala PSC exam adds more colour to this issue of 'Thozhilveedi'. Durga opens her minds to the readers explaining about her strategies applied in the various exams including the 'Last Grade Exam'. While going through the pages, 468 vacancies for nurses, 568 jobs in PGIMER, 1670 constables in BSF, 312 tradesman in Kochi Shipyard, 163 vacancies in MECL, 10 Medical Officers in BHEL, various posts in ISRO and 7 posts in Defense Ministry would enable people with desired qualification to apply for the posts. Solved papers of Last Grade Servant for various/Attender in Travancore Cochin Chemicals Ltd and Lift Operator various/Assistant Time Keeper would be useful for those candidates who are preparing for the upcoming Kerala PSC Last Grade exam. Special crash coaching for Last Grade, SI, Excise Guard Inspector, Woman Police Constable, Woman Excise Guard, Male Warden and Female Warden can support the preparation for those PSC aspirants. As usual the exam coaching for SBI exam by Time Institute is continued in the 5th July 2014 issue too. 'Thozhilveedhi' is not just a employment news weekly, it has become a part of the life of a huge reading community in Kerala, especially among the youngsters. This news weekly has already served as an effective platform for job vacancies and career training. Having a circulation of more than 1 lakh prints, 'Thozhilveedhi' has changed the life of many young people. It is advised that, job seekers who are keeping high dreams with Kerala PSC can best use this issue of Thozhilveedi for rising opportunities and also could apply for their preferred posts.